Do you like tying Blob Flies? 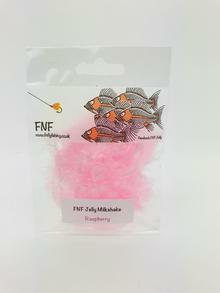 Now you can with all of the FNF Fritz, Jelly, and Daphnia you could ask for. 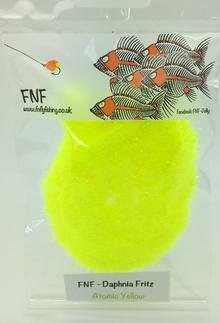 All the way from The United Kingdom, FNF started in 2016 and hit the fly fishing industry with a bag, capturing the eyes of many fish and fly tiers. Softer in the fish mouths. This is the most technically advanced material available. 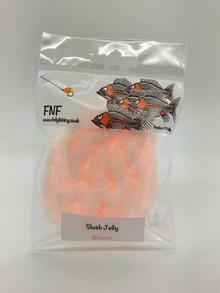 ​Rob Edmunds "Use the new FNF Jelly fritz if you want to catch more fish"
Iain Barr "New FNF Jelly ties the most fantastic blobs, the fish love it"
Gareth Jones - "Nymphos used the original FNF Jelly in 2016, we will use the new Jelly in 2017"
Kieron Jenkins - "I can see the technical advances in the new Jelly, love it"
​We have given the FNF UV jelly a serious upgrade and added a few more colours to the range. 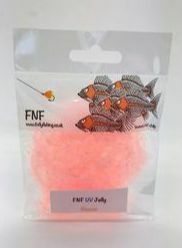 The UV fibre has been blended with the new Jelly fibre creating a lovely fritz. The fibres are as narrow as is possible to make allowing them to flare in the water and create little UV balls of light. to use on booby bodies. It has all the same characteristics as its big brother. Standard 15 is a beautiful soft boosted fritz. The material is bonded and mounted on a micro core for easy use. 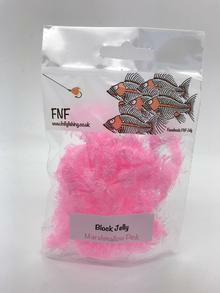 Block Jelly is a blend of opaque and jelly fibres. The opaque fibre has been designed to reflect fluorescence light from the tips and edges of the jelly fibre while creating a block colour in the water. 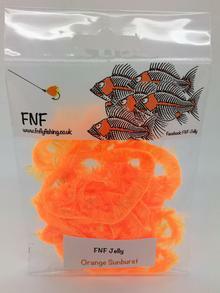 Very importantly the fibres like its sister jelly fritz have been cut and compressed as small as technically possible. Very importantly this is an un-boosted fritz allowing it to flair open in the water while static and close fibres when pulled, giving the pattern lots of movement. 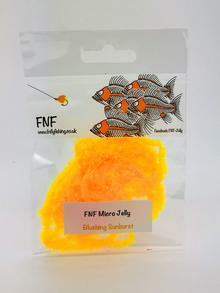 FNF have taken our new jelly fritz and added a little twist. We have managed to dye a range of colours that allow a soft UV under-body to shine through. This effect gives the patterns a unique look. Please note the UV blue aura is only visible in daylight. You just wont see it in artificial light. The brighter the conditions the more the colours ping. The colours are very soft to give the maximum effect. We just know this is going to quickly become a secret weapon. ​This is the new Daphnia Fritz produced and developed solely by FNF. This material will give you a completely new style of blob or egg pattern. 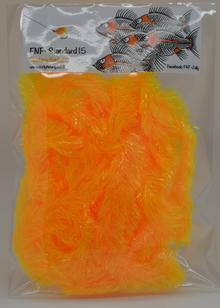 The completely translucent fibre is bonded to a micro core for easy tying. The material is very dense and only takes approx 5 turns to fill a size 8 FNF blob hook. Wide gape hooks are required in conjunction so as not to mask the hook point. The translucency of the material will allow other colours and beads to bleed through. 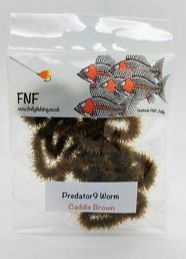 ​Predator9 Worm is a soft mobile materials designed with snake and worm patterns in mind. 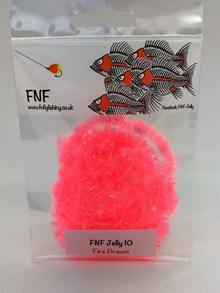 FNF believe this pattern will be hugely successful on all predator fish either in Sea, Lake or river system. If you fish bass, you need Predator9. 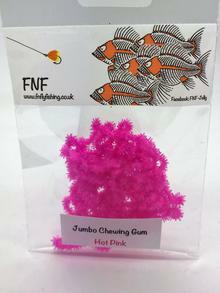 ​FNF Jumbo Chewing Gum is a synthetic material designed primarily for worm patterns however it has many different uses, for example shrimp bodies. 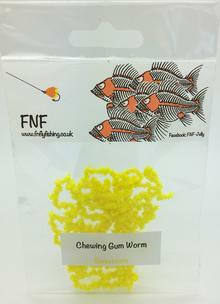 This material is a soft rubbery chenille ideal for bodies and chewing gum worms. The soft material is mounted on a nano core so it can be easily stripped of to tie in. The gum is buoyant so when tied in to flies it will slow down their sink rate. This has proven very deadly when creating worm patterns. The fly sinks very slowly holding in the kill box for longer. Tie in a bead if you want to fish it under a bung. 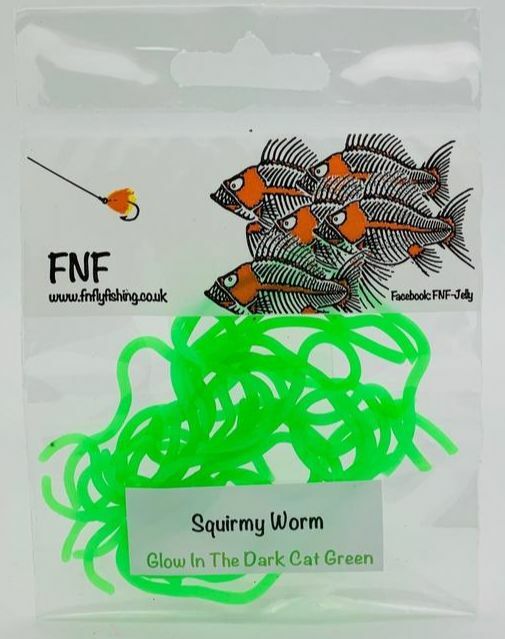 FNF has taken the popular squirmy worm and spent time boosting, and UV rinsing some of the colors to give an added edge. This Squirmy is as durable as we have ever tested. Approx 1.5m in every bag.